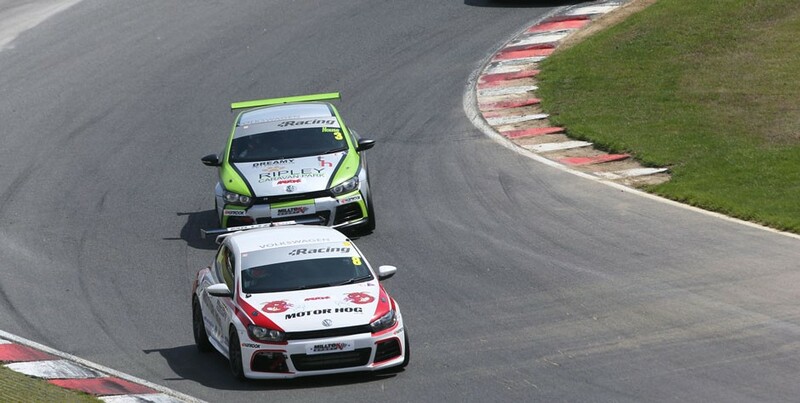 The 2013 champion, Aaron Mason, ended his Milltek Sport Volkswagen Racing Cup victory drought in fine style at Brands Hatch this morning, seizing control of the championship’s 11th round on the opening lap and holding on to record a narrow victory over Phil House. 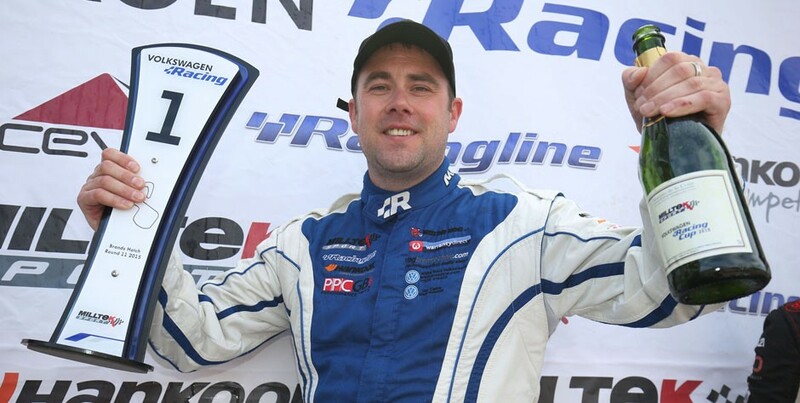 It was Mason’s first win since Donington Park more than 10 months ago, and sees him narrow the points gap between himself and season-long championship leader David Sutton. Sutton endured a miserable race, contact early on dropping him down the order and an eventual 13th place finish, his worst result of the year. AWM Scirocco driver Mason’s win – the 21st of his VW Cup career – was the result of a useful technical improvement made pre-event, some excellent driving and a bit of bad luck for House, who made a storming start from second on the grid to overhaul wheelspinning pole man Tom Onslow-Cole and lead into Paddock Hill Bend. Mason took advantage of Onslow-Cole’s tardy getaway also to slot into second and then passed House for P1 up Hawthorn Hill as Phil struggled with his gearstick. “I got an absolutely brilliant start,” said Phil, “but then the gearknob just came off in my hand on the run up to Hawthorn. I managed to get it back on but it just gave Aaron a run on me and that was that. 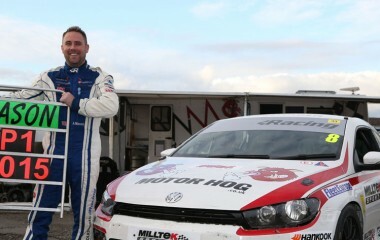 So frustrating.” It was bitter blow for House, who only recently managed to overcome a troublesome overheating problem with his PH Motorsport Scirocco which has blighted his results for 18 months. By the end of the opening lap Mason led House by nine-tenths of a second. Phil managed to narrow the gap to 0.2s by the end of the sixth, but his hopes of regaining the lead were then dashed by a lengthy safety car period. The race was restarted after 10 laps and with a lap to run, but a defensive drive from Mason ensured he stayed ahead by a 0.6s margin. 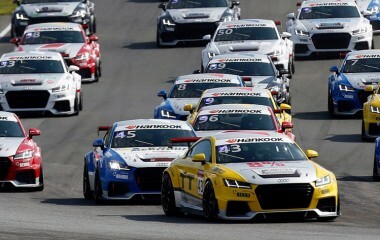 Orrock took fourth at the line, a second ahead of Howard Fuller, with Spa double winner Michael Epps battling through from 11th on the grid, his lowly start slot the result of a steering failure on his Team HARD Golf, to claim sixth at the line, and with it pole position for the second Brands race. 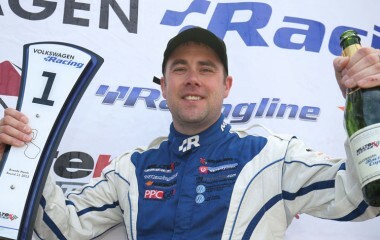 Robert Barrable placed seventh in the THM Racing, the Irish rally driver surviving a fourth-lap clash with Sutton, which cost David eight places and which also delayed Joe Fulbrook. 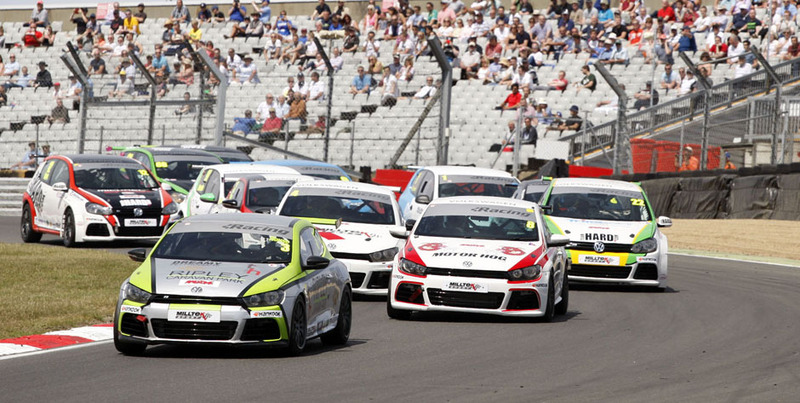 Joe McMillan’s Cobra Engineering Scirocco set fastest lap on its way to eighth, ahead of Fulbrook’s Golf, which was further in the wars at the final corner with a collision involving the Team HARD Golf of BTCC racer Aiden Moffat, whose race ended just short of the line. Sam Edwards completed the top 10, just ahead of his Team HARD running mate Bobby Thompson, who dropped almost to last on the opening lap after boiling his clutch on the grid. 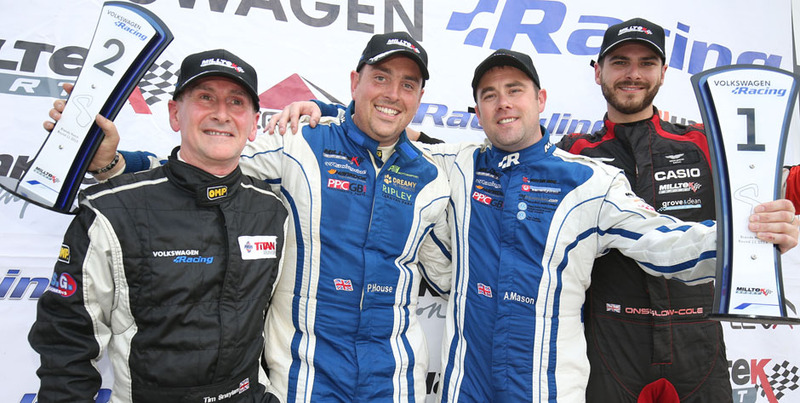 Simon Rudd took a home-track 12th-place finish ahead of Sutton, Pete Littler’s JWB Scirocco and Tim Snaylam, whose 15th position earned him the Sportsman’s Trophy. “I had a excellent race,” said Tim, “but I’d like to finish a bit higher up; I can beat the gentlemen OK, it’s just the rest of them I struggle against.” The finishing order was completed by Matthew Wilson, Simon Tomlinson, Laura Tillett, Paul Dehadray, Mark Clynes and Damani Marcano. Jack Walker-Tully was another to suffer damage, his Cooke and Mason Scirocco retiring after a lap following contact in the pack. 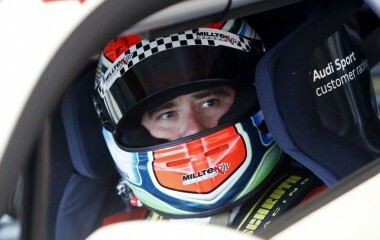 Darelle Wilson suffered a misfire and championship newcomer Dan Clark a blown engine.